Laurie Hilton is all in holding 6♠5♠ and has been called by Catherine Connaughton holding A♠Q♣. The 6♥ appears in the window, giving Hilton a pair of sixes. But unfortunately it's followed by the 4♦ and the A♦ (giving Connaughton a bigger pair). 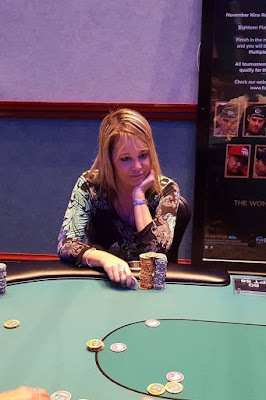 The 7♣ turn gives Hilton additional straight outs, but the 2♠ river does not improve her hand, and Hilton is eliminated in 3rd place, taking home $1,664.